I made an awesome Pac-man costume! 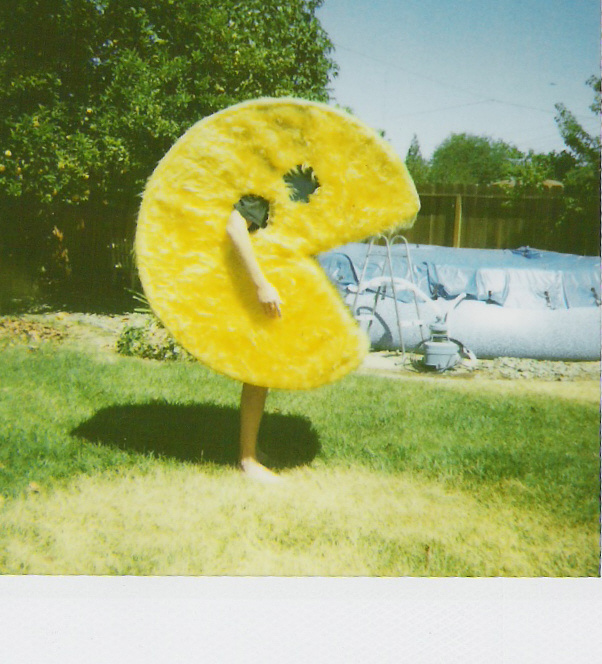 I've seen some pictures of Pac-man costumes on the net, but I wasn't able to find any that are as cool as mine (although it's possible they did exist back in the 1980's). 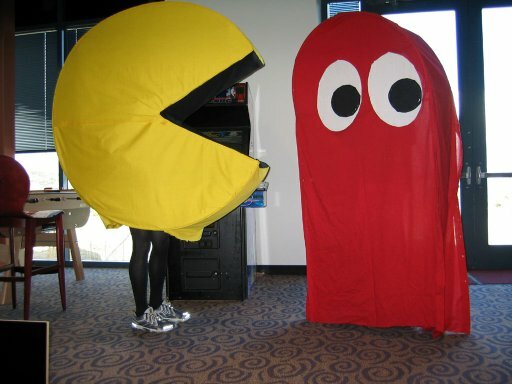 If anyone has any pictures of pac-man costumes posted on the net then let me know and I'll link to them. Here's what it looked like after I finished the frame. You know, it's surprisingly difficult to get a circle to be perfectly round. 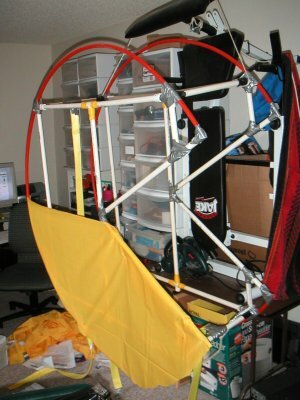 I attached a string to the center and went around the edge and taped the circular tubing to the rest of the frame at just the right points. Now I have hung it up and put some fabric on it. You never think about these things until you actually try to build something like this, but a costume this big doesn't just float around on you. You have to attach yourself to it in some way. I've used two belts. One goes around my waist and attaches to the 4 corners on the bottom. The other belt goes around my chest and attaches to the upper back part of the costume (to balance it). I won the group costume contest at work! The top of the ghost costume looks a bit lopsided, but it's really an optical illusion that results from the placement of the eyes and the angle we're looking at the costume. The top is a tiny bit lopsided, but not nearly as much as it looks like in that picture. The fabric hanging down near my legs is the result of me accidentally tearing the stitching when I stepped too widely. I received two emails from someone named daqmustang. They kindly included pictures of a pacman and ghost costume that someone else had made. I have no idea about when these costumes where made or where or who made them. But, the pictures are very cool, so I'm displaying them here. 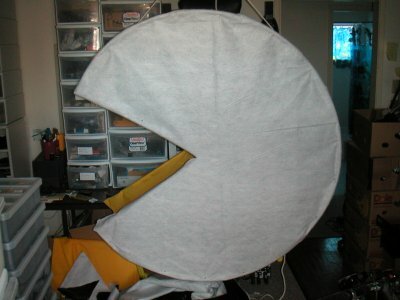 I found the following image of another Pac-Man costume in google images. But, this tiny image is all there was. The link to it was broken. If anyone else has pictures of classic video game related costumes then feel free to email them to me! As is usual at this time of year, I have been getting plenty of requests for more information about how to build the Pac-Man costume. It's great to hear from all of you! This year I actually started building another Pac-Man costume for someone else and after sketching out the design I realized that with my ability to create my own arbitrarily curved pvc pipes I have the ability to do a new type of design. Keep in mind that the numbers in the bottom right are a bit mixed up. The A, B, C, E numbers apply to the lengths of the parts in the right diagram. There is no D in the right diagram. That applies only to the left diagram (I accidentally left it in when copying numbers over). The lengths for the parts on the left aren't labelled because I did the calculations and wrote down the results on another paper. I'm not sure where that paper is, so I've recalculated the total lengths of each section. Keep in mind these are the total lengths. The joints actually take up length as well, so the pipes you cut will actually need to be a bit shorter. The diagram on the left has an inner box with a curved outside which is similar to the design I used in my original Pac-Man costume. However, after building that I found that the curved outer pipes actually are strong enough to support the costume by itself, so I just dropped the interior. The result is a much simpler design. 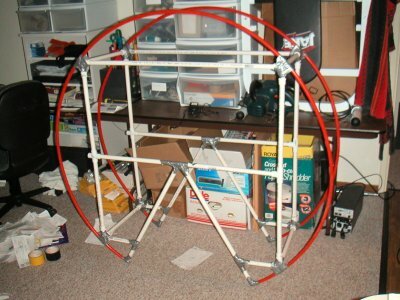 If you want to curve pvc pipes yourself, you'll need to get a ring roller. Just search amazon.com or ebay for "ring roller" and you'll find one. The cheap ones (like the one I have) cost about $130 plus $70 shipping. Most people who email me ask about how to get the curved pipes. For all of you out there who lack a ring roller and have no intention of getting one, you have a few options. 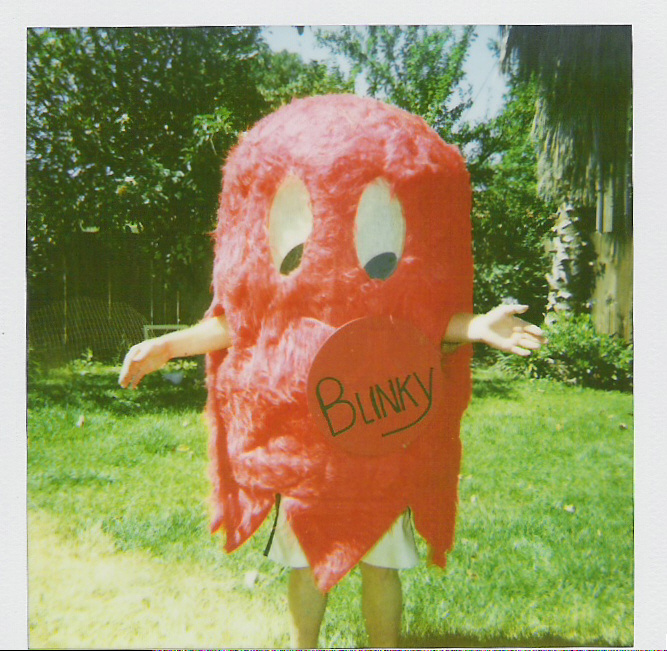 BTW, by telling you this here I will probably stop receiving email from all you wonderful pacman costume builders. So, please email me pictures of your costumes (during construction and after they are finished and when they are in use). I love to receive them! Anyway, the easiest option is to use hula hoops. However, when you go to the store to check them out you will find that they all come in relatively small sizes. They work fine for a small Pac-Man, but they are useless for large costumes. They are very stiff, so you can't just bend them out. Another option is steel wire. You can buy spools of heavy steel wire at Home Depot Pro. I don't know why, but it is located in the gardening department and comes in 100 foot spools for about $10 each. Just use bolt cutters to cut it to the appropriate length and then use duct tape to put it on the costume. There are a few other creative options which I never explored. For instance, you could get garden hose and fill it up with "Great Stuff" insulating foam. I don't know if that would work. It might be hard to get the foam down into the hose. You might need to cut holes in the hose at places and fill it up there. Once it hardens the result will probably be a relatively stiff garden hose. For my own purposes I still think bending pvc pipe with a ring roller is the best. 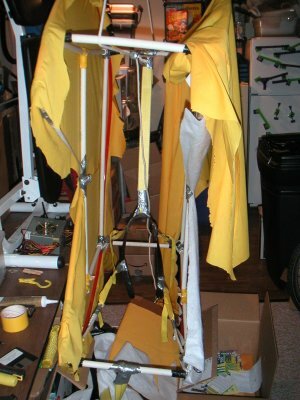 The reason being that you can connect the curved pipes to the rest of the costume using standard pvc joints rather than tons of duct tape. My current email address is listed in the menu near the top right part of this page.